program and keep water with you at all times during any exercise session to stay hydrated. 30-45 min at day. At least 5 days a week. My goal is at least 12mi/per week. 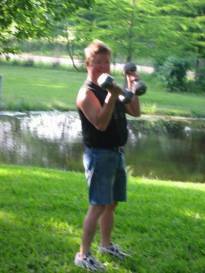 I do several of the upper-body machine weights and do 2 sets for each exercise. My goal is once per week. I swim 3 to 6 laps. This exercise has helped my breathing a lot. It has strengthened my diaphragm. 50 squeezes in left hand, then 50 in right hand, Again. 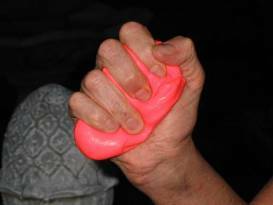 To obtain therapy putty, just do a google.com search. 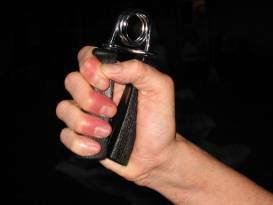 Squeeze 10-15 times, then hold it tight as long as possible. 1. Do jogging/running intervals with your daily walking. 2. Swimming, as mentioned earlier, is an excellent exercise to help your breathing. 3. 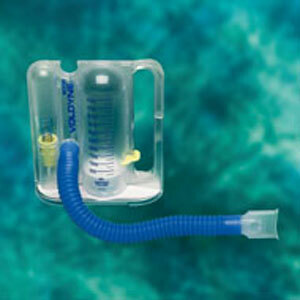 Use the Incentive Spirometer daily to exercise deep inhaling. Do at least 10 reps daily. Practice this exercise until you are able to do it without conscious effort.